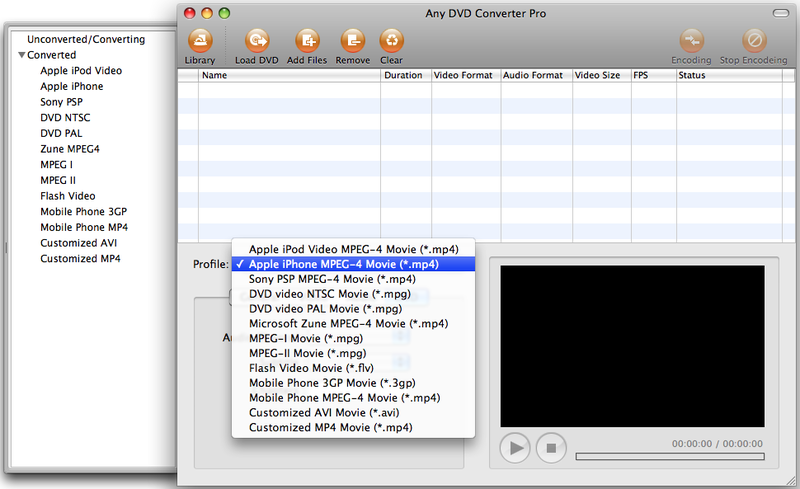 Any DVD Converter for Mac is powerful, ideal Mac DVD ripper and All-in-One video conversion software to rip your DVD movie to video/audio files like rip DVD to MPEG, rip DVD to AVI, WMV, DivX, MP4, MP3, etc., which can be perfectly played on most portable players such as iPhone, iPod, Apple TV, PSP, Xbox 360, PS3, iRiver, Creative Zen, Archos, PMP, Smart Phone, Pocket PC, PDA, cell phone, MP4 Player, MP3 player, and other video players. ...... and audio players on Mac OS X. Any DVD Converter for Mac is Mac DVD ripper and Mac video converter software to rip your DVD movie to video/audio files like rip DVD to MPEG, rip DVD to AVI, WMV, DivX, MP4, MP3. This Mac DVD Converter lets you select DVD subtitle and audio track to convert DVD movie with any available language, along with setting video brightness, contrast, saturation and so on. It supports downloading video files from YouTube, Google Video. It also allows you to choose any chapters or titles to convert and trim the length of each title or chapter. Qweas is providing links to Any DVD Converter for Mac 4.1.1 as a courtesy, and makes no representations regarding Any DVD Converter for Mac or any other applications or any information related thereto. Any questions, complaints or claims regarding this application Any DVD Converter for Mac 4.1.1 must be directed to the appropriate software vendor. You may click the publisher link of Any DVD Converter for Mac on the top of this page to get more details about the vendor.